For this month’s customer story we sat down with Chris Warner, millennial entrepreneur and founder of professional copywriting business Convertle. He shares his thoughts on how to grow your business whilst travelling around the world. In the last year I’ve visited 14 countries, including 23 cities. I’ve taken 12 planes, 8 trains and two intercity coaches. I’ve experienced my first earthquake (6.4 magnitude) whilst is Taiwan. I participated in a piece of performance art on a train between Dresden, Germany and Wraclaw, Poland. I also lost far too much money gambling in Las Vegas (sorry Mum). All my travels have been paid for, on the road, whilst working on my own business. A year ago, I quit my 9-to-5 job and began freelancing as a copywriter and online marketer. I’ve now built my freelancing work into a brand that I operate under Convertle. And I’m now focused on growing it into a company. Ambitious, or just plain stupid? Those of you that run your own business or freelance will know how difficult it is when you’re starting out. Maybe you’re thinking that it’s crazy to add another layer of complexity by travelling. And you’re probably right. One of the biggest difficulties is wrestling with wifi connections. Thank you Phnom Penh for when half of the city lost its internet and electricity for four hours. You also get used to working absurd hours. It was a struggle to get up at 3 am in Kuala Lumpur for a call with one of my Vancouver-based clients. However, it’s easier than ever to manage your business remotely. There are so many tools now available, like Zervant, that allow you to work more effectively. You can automate many of the repetitive business tasks and focus on delivering your core service. If you’ve dreamed of seeing more of the world but are scared of stepping away from your business, why not do both? For some people I believe this setup can even be optimal. There is something inspiring about the transforming scenery, new people and languages that change every month. You become more comfortable with problem solving and coming up with creative solutions for your clients because you’re having to do it in your day-to-day life. You become better at focusing on work because you don’t always have the luxury to focus on it. You gain a broader perspective so you’re able to look at your work from different angles. A secret added bonus is that you seem to lose the ability to burn out. The constant exposure to new surroundings seems to have a magical effect where you can work 10 hours a day, 7 days a week, and feel absolutely fine. A key point to note is that travelling is not a vacation. You’re not spending all day, every day sight-seeing and taking photos. Travel takes place more slowly. When you know that you’ll be settling in a city for a month, you know that you’ll have time to see everything whilst getting your work done. Moreover, you can make it what you want. You could decide to stay in one location for three months at a time and really get to know the place and integrate. You can join a gym, make new local friends, and feel part of your new temporary home. On the other extreme, you can be more nomadic, staying in places for only one – two weeks. It depends on your personality and which style you’re more suited to. And you can always mix-and-match when you feel like it. For the record, my longer trips tended to be 1-1.5 months, punctuated with shorter 1-2 week periods to freshen things up. Don’t get caught up with the image of the backpacker, schlepping around hostels and sleeping in dorm rooms. If you fancy that, then great. But if not, services like AirBnb mean that you can stay in your own apartment wherever you are in the world. You don’t have to be pigeonholed in any area of travel. If you think something will work for you, go for it. If it doesn’t, revert back to the other option, no harm done. You can find coworking spaces in most cities to work alongside like minded people, or if you’re more solitary and/or minimising expenses, you can work in cafes or your accommodation. As long as you have an internet connection, you’re good to go. Whichever option you choose, you’ll find that you have more time because you fall out of unproductive habits. You probably won’t watch much TV while you’re away, so you work. You don’t go for regular drinks after work just out of habit. You go for a drink with new friends because you’re excited to. And, when you could be visiting the Berlin Wall, you’re not going to be spending two hours refreshing your Facebook feed. Jay Meistrich, Co-Founder of Moo.do, spent a year travelling when he first developed the software for his product. 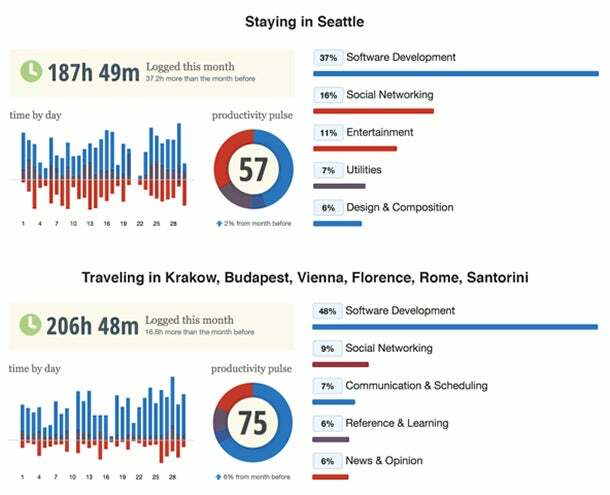 Tracking his productivity with RescueTime he found he was more productive when travelling by 132%. When you’re travelling, no two days are ever alike. However, to give you an idea of the type of activities that take place I’ve laid out a not-uncommon day below. First order of the day is to check whether there have been any major updates during the night. Working with clients from San Francisco to Melbourne, my working day never really stops. If anything has happened overnight I may need to change my focus for the day. Barring any major disasters or urgent requests, I start with client work. There are so many free online tools available to use for different types of work. I like to use Google Apps as they are automatically backed up in the cloud. I use an offline-editor Chrome extension so if I am struggling to get online, I can still be productive. Once my “creative work” (I truly cringe at that phrase!) is complete it’s onto more practical business activities. Chiefly, making sure I’m billing the right company for the right amount and getting paid! It’s here that Zervant comes into it’s own. Being able to quickly create and send invoices means I can spend more time on my favourite activities (next up). I like to sightsee in the middle of the day so I structure my day to focus on important tasks first thing. I then head out for lunch and spend the afternoon seeing what my current city has to offer. This could be anything from visiting the world’s biggest indoor theme park (Seoul) to relaxing in one of Europe’s largest thermal baths (Budapest). Evenings are usually unplanned and depend on how many projects I have and where I am. They are used to sweep up activities that have spilled over from earlier in the day, or just urgently need to be finished. Hopefully, this has given you some ideas of how you could make this work for you. You really don’t have to decide between working on your business or seeing more of the world! If you’ve been thinking about it for a long time but not quite had the courage, go for it! If you go away for three months and decide it’s not for you, it’s not an issue. You’ve experienced something new, you’ve learned that it’s not for you, and you won’t spend hours wondering about whether you should try it. If you are looking for advice, want to chat about travelling in general or you just think I’m wrong and want to let me know, get in touch. You can contact me directly at chris@convertle.co.uk or on Twitter @chriswritescopy. Our software will help you create, send and manage your invoices (as well as estimates and receipts). Best of all, it’s 100% free. Why not give it a try?